Our professional skin consultation is an excellent starting point for anyone wanting advice on what condition their skin is in, what products they should be using and what treatments they should be having. We include professional photos from our VISIA skin analysis system which allows us to take clear, real life images of your face. Our Visia will take 3 photos and analyse them to provide us with integral information that we then use to give you the best advice possible. Gaining the information from a VISIA as part of our consultation allows us to accurately understand what your skin really needs. Knowing and visually seeing your unique skin profile forms the beginning of your journey to clearer, better skin. VISIA analysis assesses the state of all of your skin’s layers. This includes what we can’t see with the naked eye. Underlying pigmentary disorders or inflammation can now be seen, allowing for a personalised, correct skincare regime and treatment program to be devised specifically for you. Your skin is cleansed and you then rest your head into the VISIA booth so that 3 photos can be taken (each side of the face and a front on image). 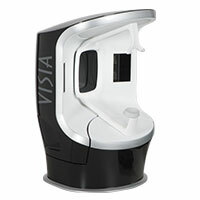 Multispectral imaging allows the VISIA to identify and analyse your visual complexion. During your consultation we will explain the images to you, and then provide you with personalised treatment options and homecare recommendations. Scores for each of the above factors are given. These scores are evaluated after the VISIA compares your particular skin against thousands of others in its database. The computer then stores your images so that we can refer to them in the future. These scores and stored images are particularly useful to track progress and improvement of your skin after a course of treatments or a new skincare regime. Better diagnosis means better care. VISIA analysis allows us to accurately understand what state your skin is in. It gives us insight to the deeper layers that are normally not visible. This vital information is the basis for recommending you the right products and treatments. Starting your skin journey with a VISIA analysis and thorough consultation will steer you in the right direction to clearer, more rejuvenated skin. Contact the team now and schedule a skin consult with VISIA analysis.